Frog - Visual Dictionary - Copyright © 2005-2016 - All rights reserved. [img]https://infovisual.info//storage/app/media/02/img_en/026 Morphology of a frog.jpg[/img] [url=https://infovisual.info/en][/url] - [url=http://www.infovisual.info/]Visual Dictionary[/url] - Copyright © 2005-2016 - All rights reserved. 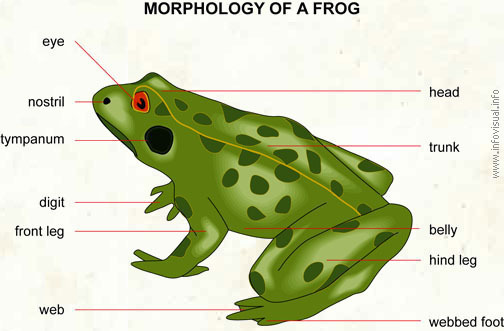 Morphology of a frog: web-footed amphibian which lives near lakes and ponds. Moves by swimming and jumping. Head: uppermost part of a frog. Trunk: central part of a frog, to which are attached the head and limbs. Belly: underside of the trunk. Hind leg: rear limb of a frog. Webbed foot: one of a set of jointed appendages that are connected by fine skin. Web: fine skin connecting the fingers. Front leg: front limb of the frog. Digit: jointed appendage of the front leg. Tympanum: hearing organ of the frog. Nostril: entrance to the respiratory system of the frog. Eye: sight organ of the frog.